2.9. The current scene, a new era? We have come a long way since the first forays into mill building; mock Palladian mansions have turned into signature architectural icons or bland sheds. The story as far as this essay is concerned lies around structure and physical aspects of factories. There has been fleeting mentions of working practices; social, representational, and political issues are left for another work. The story has been one of innovation, in materials and technologies, adaptation, of buildings and processes, and reaction to changing architectural styles and influences. Factories have been glittering show pieces, secreted away into the landscape, or just taken for granted as rows of uniform boxes within the local trading estate. We have also witnessed dereliction, of individual buildings, and complete areas as political, market, or individual business demands change. Posterity shall mourn some, such as Firestone, Brynmawr or Reliance factories; others have a welcome departure from the lives of people who were fated to exist as virtual machines within their walls or lived near their ugly countenance. Some have learnt to adapt, their basic forms being suitable to a whole range of industrial uses, others, including the giant Lister mills at Bradford[i], have gained a reprieve from destruction, by becoming part of the trend for regeneration and conversion to other uses such as housing, commercial or office space. Others, such as the Magna ex-steel works at Rotherham[ii] (figure 2.54) or the Iron Bridge gorge museum, Shropshire, have become part of the heritage and education industry itself, teaching the latest generations how their fore fathers lived and worked. Industrial architecture so often the Cinderella of architectural theory writings maybe deserves a closer look. What can we say about the cladded sheds or boxes that we experience on a daily basis; those “inscrutable envelopes of human activity”[iii] as Gillian Darley states. Although whether icon or humble, they all have a story, a feature, an effect upon us in some way. Tom Dyckhof of the Times has recently discussed newly completed BMW car factory in Leipzig (2005)[iv] (figure 2.55) along with mentions of other earlier factories such as Ford’s Kahn designed works, The AEG building and others such as Roger’s efforts in Swindon. In the article he mused of the times when people romanticised about mass production, “when the production line was fantasised about as a thing of beauty and liberation, not oppression”, and when the “sight of a well-oiled machine could wring a tear from the eye of the grandest of industrial magnates”. Maybe this iconic factory by Zaha Hadid[v] has finally taken Cinderella to the ball. [iii] Gillian Darley, Factory, London, 2002, page7. [iv] Tom Dyckhof, “Talking about a revolution”, Times T2 magazine, 14,06,2005, pp10-11. Moving towards the 21st century, there have been a number of “signature” buildings with overt exterior architectural features following on from the Renault building. The Vitra[i] building by Frank Gehry[ii] 9 Figure 2.48) started in 1987 as a factory but now a museum displays its disjointed elements as floating blocks, the Igus factory (1992)[iii],(figure 2.49) a slick shed with its demountable office pods and ventilation domes sitting under the two large yellow painted masts as the factory itself lies apparently suspended below. We should also note the Motorola factory, Swindon, (1998)[iv], (figure 2.50), with its cigar shaped roof covering an internal “street” where staff can socialise, infamous for its part in one of the James Bond movies, and also an extreme showpiece such as the Volkswagen “transparent factory” in Dresden (1999-2000)[v]. Although we could look at the emerging new materials, resins, fibres, metals and plastics, some sandwiched together to insulate, seal, and increase strength, they are for now just adaptations of what has been, their worth is yet to be evaluated. The real innovations are now on the shop floor, with robotics emptying the workspace of people, and the deployment of modern ergonomics and special planning. Where humans are still part of the process, innovations are shown with the introduction of theory that workers are not there just to perform tasks as part of a well-oiled machine, but are part of a larger integrated social structure. Ideas such as “group technology” where teams of workers take control of processes to help control the boredom of the production line. [xiii] Flexibility is the new mantra and the ability of the workforce to adapt for change could be just as important as merely having a flexible building structure. [xii] Adnams brewery. Located in Southwold Suffolk. The distribution centre lies just outside this sea side town. [xiii] Nissan, the Japanese car makers, introduced group working into their factory in Sunderland. 2.7. The “Cool” box, the “functional tradition” and the arrival of “High tech”. In 1951, Francis Wylie in his published talk entitled “Industrial buildings” stated, “factory building is no longer the Cinderella of the drawing office, it has become industrial architecture. 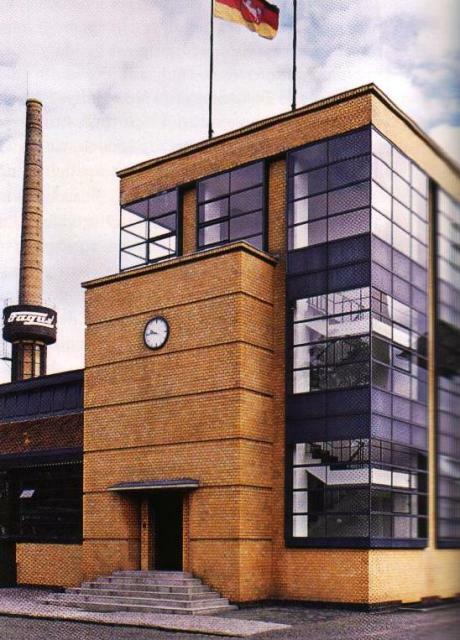 In 1952 two such designed buildings were widely publicised, the handkerchief mill in Blumberg Germany, by Egon Eiermann[i], (figure 2.32) and the Dynamometer building at the General Motors research building in Detroit by Eero Saarinen[ii] (figure 2.33). Both displayed an exposed black painted steel frame with high levels of glazing, their streamlined aesthetic derived from the work of Mies van der Rohe[iii]. In the USA, the firm of Skidmore, Owings and Merrill took up this new “cool box” style and demonstrated it with several buildings[iv] in the 1950s including a building for H. J .Heinz[v] &Co Pittsburgh, Pennsylvania (figure 2.34) where they used the exposed black steel frame glazed with blue glass framed in aluminium. This style arrived in Britain with the Processing building for Cooper Taber at Witham, Essex (1955) [vi](figure 2.35). This building too had an exposed steel frame painted black, slender in appearance, with all other space apart from the services on the roof taken up with glass. This exposed, and possibly celebrated the machinery seen within. Was this the natural descendant of the Sheerness boathouse with its early-unrecognised exposure of the structural frame? This generation of factory buildings and later ones benefited from the cross pollination of technologies from other industries. They could achieve this high level of glazing using new sealants derived from the car industry, and for the frames , the use of corrosion resistant “Cor Ten“[vii] steel developed for railway freight wagons and heavy plant machinery. Further developments in reflective glazing and pre-cast concrete elements proved useful for 1960s buildings, and the advances in aluminium cladding profiled steel sections and plastic sealants encouraged these “boxes” to become even lighter. In 1958, James Richards published “The Functional tradition”[viii]. In it, he expressed the fact that the prototype buildings of the nineteenth century had also prepared modern taste for their successors. He celebrated the efforts of the “pioneer efforts of the engineers” and the more orthodox builders of that time who served the needs of the trades and businesses. Now seeking consolidation after innovation, he felt that the latest generation of architects might aim at “such a vernacular” by perhaps emphasising the functional precedents. This intended new vernacular turned out to be mainly imported, mostly from the USA. The “Architects’ journal” described them as “prestige pancakes”. These elegant sleek buildings, usually based on the Saarinen ideal were set in green field sites, usually landscaped, as in his original General Motors model. Often the companies were American as in the Cummins Diesel engine Company[ix] who commissioned one of these sleek boxes in Darlington, Co. Durham (1966), (figure 2.36). Architects Kevin Roche and John Dinkledoo, inheritors of the Saarinen practice used a blend of Cor-ten steel and neoprene[x] gaskets (the first time in the world) to create this sleek single storey highly glazed “pancake”. It sat amongst landscaped grounds, and internally physical demarcations were dissolved between factory floor and offices, a pioneering change for British industry. The factory had gone full circle, from country mill, to town and city factory and back to countryside again. Contemporary with Cummins, building features such as masts, cables, bracing and exposed air-conditioning plant, often painted in bright colours became apparent. This style was to become known as “High tech”. Some architect-designed industrial buildings lent themselves to “architectural engineering”, i.e. structural elements being used more for effect rather than reality. The Reliance Controls building Swindon (1965)[xi] was such a factory (figure 2.37). Designed by Norman Foster’s “Team 4”[xii] architect practice, it was a cheap and flexible “shed” for an American electronics company. It was noted by its exposed crisp cross bracing between the bays of the external steel frame, which sat in front of corrugated cladding or glazing panels. The architects admitted it was “just for visual effect only”. The late 1960s in Britain also saw two other factories of note. 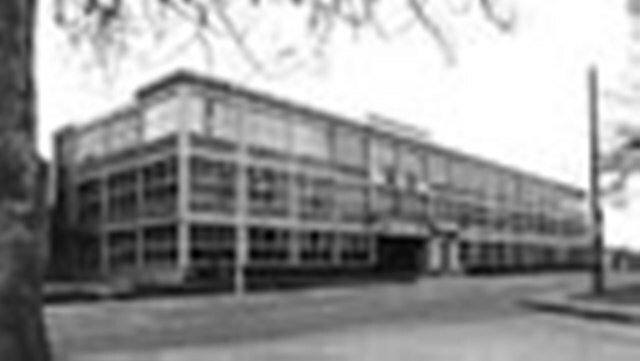 The first one designed by Yorke, Rosenberg and Mardell partnership, (of Sigmund pumps, 1948), was the new factory for The Bath Cabinetmakers Company [xiii](1968) (figure 2.38) in the south west of England. Here they exploited a lightweight tubular steel space frame[xiv] to support the roof, enabling long spans and free floor space without heavy steel members. The other building, also in Bath was a new factory for Rotark controls (1968)[xv] (figure 2.39). Here again use of the space frame enabled uncluttered floor space, but it was taken a step further by being carried through at roof level to give form to the exterior. The inclusion of glazing around the edge gave subtle lighting to the interior (figure 2.40) .The other point of note is that the entire roof frame was at first assembled on the floor and then lifted up into position. In the 1980s, factories that took the notion of exposed structural members, both for visual and practical effect to further heights include. Firstly, Richard Rogers Fleetguard manufacturing centre at Quimper, Brittany (1979-81) for the Cummins Diesel Company where external masts and bracing rods .painted in bright red, created a structure free interior and gave the image of the structure almost holding the build up in mid air (figure 2.41). Also by Rogers, the Renault depot at Swindon (1983) (figure 2.42) displayed overt Meccano like external structural members painted in vivid yellow, its cabling and pierced metal web acting out the form of a tent. In the early 1970s and 1980s, clean lines and lightweight cladding materials became the usual face of industry. Earlier “cool box” examples expressing the face of corporate modernity were the IBM assembly plant (figure 2.43) and the Horizon (John Player) factory; both by Arup associates[xvi] (figure 2.44). This model became the norm for many industrial estates and business parks. By now, the sophisticated “shed “was becoming a standardised item. The architects, Michael Hopkins and partners were commissioned to draw up a prototype small factory unit, named “Paterae” (figure 2.44), a steel framed box with standard glazing that potentially could be bought “of the shelf “straight from the assembly line like a car. The Automobile industry that had spawned the dawn of standard factories could now be housed in units that were created like their own product. Gillian Darley states in her book “factory”[xvii], “By the 1980s Design magazine considered that the innovatory period of the sixties and seventies is coming to an end. Today kits of parts buildings designed by one time young lions …are, if not commonplace, certainly part of current conventional wisdom.” The attraction of an easy building formula meant that as Darley states “legions of disciples have adopted the same approach, not always with happy results.” Was it on the one hand becoming an architectural cliché or a popular modern vernacular? We should have to look to the ranks of industrial estates and business parks around the country to formulate our own opinion. [vi] Architects, Chamberlin, Powell and Bon. [x] Neoprene: A synthetic material resembling rubber that does not perish as quickly as rubber and is more resistant to oil, used in the manufacture of equipment for which waterproofing is important. The autumn of 1939 witnessed the outbreak of the Second World War. As in the previous war, this affected the way industrial buildings were designed. At first buildings were rushed up everywhere to meet the demand of armaments and equipment supply. 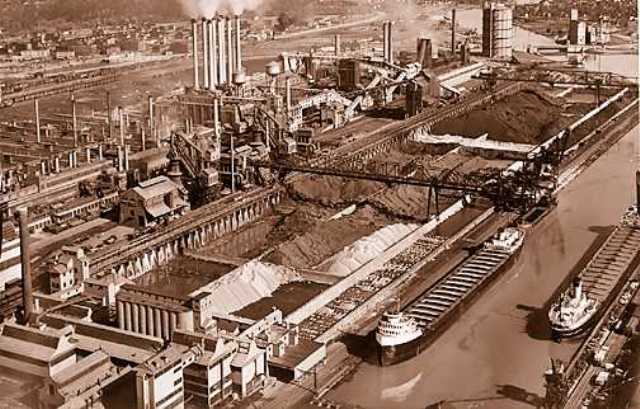 In the USA, some factories were built of great size such as the steel mills at Fontana, California to make steel for Liberty ships or the ford bomber plant at Willow run[i], in 1940 (figure 2.29). The U.S Navy commissioned Ernest Kump to build the monumental Ordnance and Optical shop in the San Francisco Naval base. Its slender steel frame allowed maximum use of glazing which flooded light in to the interior to aid the delicate operations within. Many especially in the U.K factories were converted to differing uses, from cars to ambulances[ii], from textiles to mortar bombs[iii], their pre-war flexible designs allowing this change of operations. In The UK, demand for essential materials in the war effort encouraged the use of quickly constructed buildings, using lightweight steel structural elements, asbestos-cement cladding and with north light roofing, often “blacked out” or painted in camouflage. These corrugated asbestos-clad factories set the scene of many industrial estates for decades beyond. In the USA by mid 1942, stocks of traditional materials had been exhausted by military demands. Economics and necessity meant that lightweight pre-stressed reinforced concrete and the new use of laminated timber for columns and roof structures came in to their own although at first nervously received by the builders. Newly developed resin glues and synthetic materials joined these materials in the goal of finding alternatives to traditional materials. In the USA, also, the blackout gave a boost to the “windowless factory” for a while as electrical lighting and improved ventilation alleviated problems potentially created in this environment. 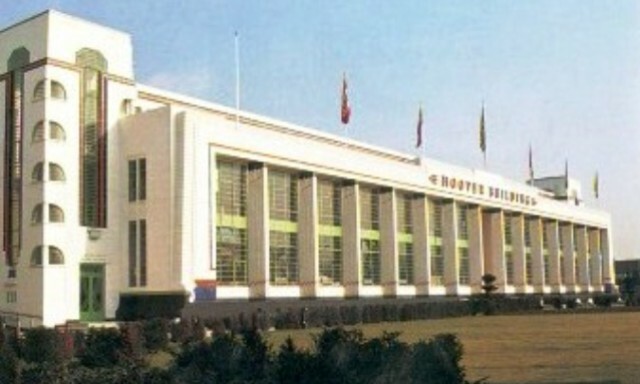 In some of the wartime buildings quality was not a high priority, but post war standards began to rise and optimism encouraged some new design built factories. One notable example in the U.K is the Sigmund Pump Factory on the Team Valley estate, Gateshead (1948) (figure 2.30). The architects Yorke, Rosenberg and Mardell set out a horizontal emphasised building with a generously glazed office and works block, complete with Kahn style “monitor“[iv]glazing in the roof. Another notable building being the ill-fated[v] Brynmawr Rubber Factory (1951), South Wales, (figure 2.31). This was the brainchild of Lord Verulam, who wished to inject life into a depressed area by creating a building embodying the highest ideals and optimism. He employed a group of recently demobbed architects, “Architects Cooperative Partnership”, and Ove Arup[vi] as engineer to create a building roofed with nine thin shell reinforced concrete domes, leaving the main floor space completely uncluttered and illuminated by its elegant top light glazing set within the parabolic vaults. In The USA post war surplus of capacity meant that some armaments factories were converted for the production of pre fabricated industrial buildings and housing, feeding on the now over supply of aluminium and steel. The firm Skidmore, Owings and Merrill (SOM), used their expertise in improved quality lightweight–steel sections to produce a prefabricated sophisticated exposed grid steel frame shed, which they started to export to Europe. In mainland Europe, regenerating after the war, notable events include such projects as possibly Le Corbusier’s only foray into factory design. During 1945 in the war battered town of St. Die in the Vosges region of France, he rebuilt a mill for Jacques Duval. Corbusier stated “ Architecture is the correct magnificent play of forms under the light “ and he employed this dictum in the functional problems of a concrete framed five storey mill by the use of “Brise-soliel”[vii] , painted ceilings, a roof garden and some of the main production space put workers on a gallery. [ii] Cars to ambulances, The firm of Charles H. Roe Ltd, at Cross Gates Carriage works in Austhorpe Road, converted the chassis of hundreds of private cars to ambulances and mobile canteens; private individuals in the city and abroad donating many of the cars to the war effort. [iv] Monitor Lighting Box style roof window light to give diffused illumination to floors below. 2.5 Britain in the interwar years; reluctance to roadside showmanship. The First World War had provided a hiatus for some in the field of architecture; others had seized the opportunity to express the use of new materials and economic design. Industrial buildings were designed through necessity and economy, the availability of reinforced concrete had provided a means for this. The Kahn designed “daylight “factory may have proved an efficient, opportune and economic means of building in this period. Some may have appreciated the new “Concrete Aesthetic” brought in by these massive unadorned and concrete frames, but in Britain it was felt perhaps to be too austere for our tastes and would benefit from a little adornment. This may be the reason that Truscon sought out Wallis Gilbert and Partners (ref.1) to collaborate with in this country. Thomas Wallis had spotted the need for efficient factory design during the war and beyond. Collaboration with Truscon would provide the leads needed. By the end of 1916, Wallis had designed three factories with Truscon, only one being built (ref.2) but all were used for advertising purposes. In the post war years, manufacturers and builders realised the benefits and economies of these standard systems such as the daylight factory could be reconciled with the freedom of choice that volume production of a standard unit that could be customised to suit individual customers needs gave them. Wallis realised this too and devised a system of compositional features and decorative elements to soften the Truscon system for the British customer. An example of this includes the General Electric Company (ref. 3), (G.E.C), Witton works near Birmingham (1918-22), (figure 2.17). 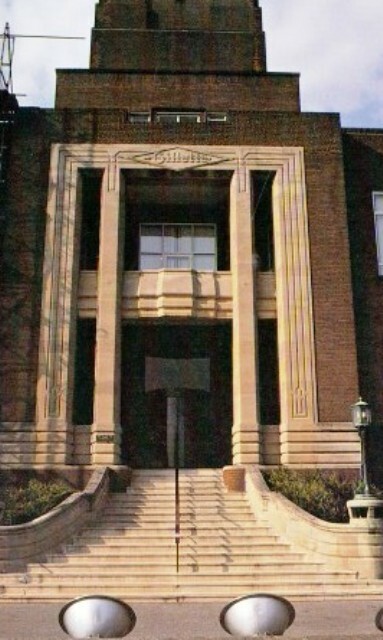 This building had a basic Truscon superstructure with muted Wallis style added “Egyptian style” (ref.4) adornment to the facade. Although expressionism had its foothold in mainland Europe, it was not necessarily enjoyed here by the British, who at this time had a reserved opinion of the “new ideas from Europe (ref.5). There was a debate between the traditionalist and the modernist camps. The former felt that the new era was best represented in Britain by an updating of traditional forms, perhaps of classical origin, without being imitative or revivalist. It was strongly supported by the continuation of “British Values “and could be described as nationalistic (ref.6). The modernists advanced an argument for uniformity, a style of architecture that could be adapted to any building type, be socially unifying, and be more representative of the new age , the technological age. It seemed likely that British architects would take a middle line using elements of both movements. 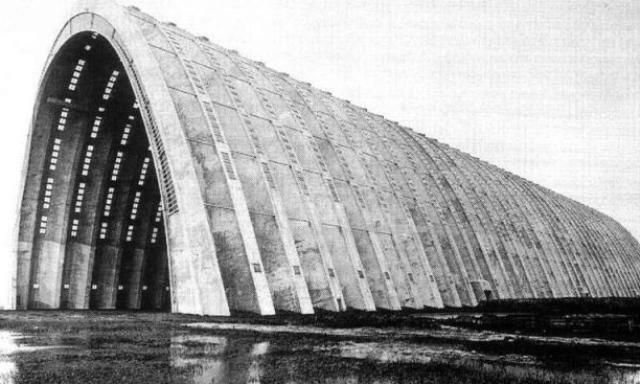 While concrete, glass and steel were arguably celebrated in Europe and the USA for example with Eugene Freysinnets’ (ref.7)Orly airport hangar (ref.8)(1921), (figure 2.18) where he demonstrated with the catenary arch (ref.9) the impressive dimensions that reinforced concrete could achieve in the hands of war-experienced engineers and with the concrete shell work of the Mexican based architect Felix Candela (ref.10). 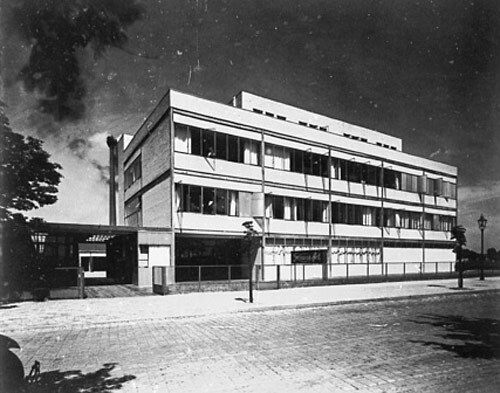 With the new construction techniques that followed on from Gropius in Europe which allowed glass to be used to full effect in the example of the Van Nelle Factory in Rotterdam (1928-30) (ref.11) (figure 2.19) and with the expression of exposed steel frame that was celebrated in the Fromm Rubber factory, Berlin (1930)(ref.12) (Figure 2.20). Although , perhaps , through the necessity of war requirements the British had embraced to some degree the concrete idea, its buildings could still effect a heavy overly substantial appearance. This was partly due to the delay in changing building regulations post 1918, and partly to the assumed contemporary notions that industrial buildings had to be solid and large areas of glass or slender concrete members could appear flimsy. It took another early employee of Truscon, Sir E Owen Williams (ref.13) to bring forward the ideas of expressionism and extended possibilities of the use of concrete to Britain. After Truscon, he set up his own company “Williams Concrete Structures ltd” to market his own patent “Fabricrete” (ref.14). He used his wartime experience to success when he was appointed chief engineer of the British Empire Exhibition of 1924 (ref.15), (figure 2.21) and gaining a knighthood for his efforts in building large-scale quickly constructed buildings. The now demolished Wembley football stadium (ref.16) being a notable example. 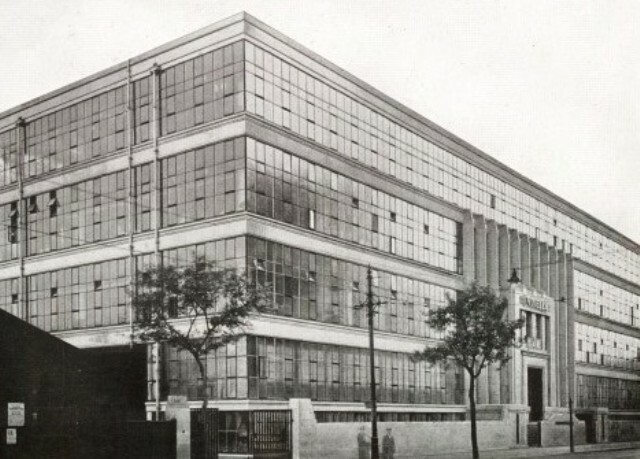 However, it was an American company, namely Jesse Boots (ref.17), who commissioned him to build possibly his most noted factory, the Boots “Wets”(ref.18) building (1932) (figure 2.22) in Beeston, near Nottingham. It was a green field site and he was working to a precise brief with production flow lines and required accommodation for precise operations and the links between these operations. The result was a highly glazed building set around two immense atria within which the production processes revolved. It was an immense four-storey slab structure building , set upon mushroom columns set back to allow the outer glass and steel curtain walling to sit uninterrupted, the production floor being lit from an vast span of bulls eye glazing panels (figure 2.23). 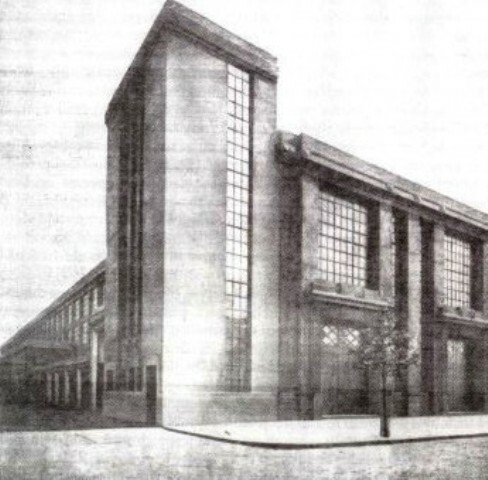 As yet, nothing had been seen like it in Britain and it could only be compared with the Van Nelle Factory in Rotterdam (1928-30). Both buildings, it should be noted, display no form of outward decoration. Possibly the only other U.K building of this genre was the factory built for the Viyella company (1932) (ref.19), coincidentally also in Nottingham (figure 2.24). The use of flat slab and mushroom column construction allowed here the use of a curtain of glass on all four sides, therefore allowing maximum penetration of natural light. This building does display a small amount of decoration with a stylised artificial stone entrance surround. Running concurrently with the developments above, there was a move to use the factory as a commercial asset. Manufacturers in the 1920s and 1930s were operating in a fiercely competitive market trying to attract an increasing domestic demand. Many factories were located near and were visible to potential customers, either near the railways or adjacent to the increasing trunk road network. A new industry, advertising was coming of age and it was now time to put this and the factory together by using the building itself as a potentially promotional device. Before this period, styling had been largely for fun or as a dressing. Advertising was limited to putting the company’s name on the chimney or tower, usually in white brick, as there was a limited audience for the advertising. The period between the wars saw a change in attitude as companies, at first mainly subsidiaries of American ones, with nationally known brands, sought prominent sites on the new roads around London. Good examples are Firestone tyres (1928(ref.20) ( figure 2.25) on the Great West road, Hoover in Perivale (1931-35)(ref.21) (figure 2.26) both by Wallis Gilbert and partners, Smiths potato Crisps in Cricklewood (ref.22), and Currys (then a cycle and radio manufacturer) also on the Great West road. Here again, although these buildings displayed highly decorated frontages to attract public attention, stuccoed in white “Snowcrete” cement (ref.23) and with brightly coloured faience, the plant behind usually consisting of a stark simple “Kahn” type building. In Fact the most striking part of these buildings was their use of colour, green window framing and red faience (ref.24) with Hoover, and coloured tiles on the “Pseudo-Egyptian” style tiles at Firestone, all emphasised by spotlighting at night. Wallis’s buildings, now often described as “Art Deco” (ref.25), or at the time often described as “Fancy”, took a lot of professional criticism by his professional peers but were liked by the public who admired their colourful facades designed to look more like a contemporary cinema rather than a dull factory. 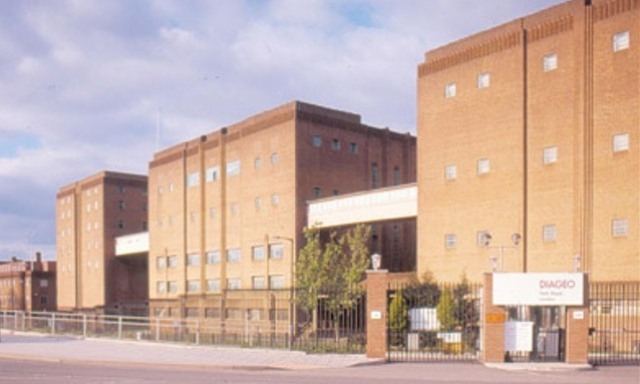 Later buildings in the same London area such as the Gillette building, Isleworth (1936) (ref.26)(figure 2.27), and the Guinness Brewery (1933-36) (ref.27), (figure 2.28) took on a more muted form with plain English brick and pared down classical ornamental elements. To conclude this section it is worth noting that although British factory architecture in the interwar period did not immediately embrace expressionism, there became a widespread use of reinforced concrete and steel construction, if only encouraged by firms and ideas from abroad. The blend of newer technologies and dressing up by British architects to adapt designs for their market produced a muted effect, although such examples as the Boots and Viyella factories pointed the way forward. Greater thought was given to the arrangement of plant to aid production, to increase the social welfare and well-being of the workforce. The emergence of newer industries surrounding the automobile (ref.28), electrical (ref.29)and chemical (ref.30)industries meant a shift from the now declining textile base of the north to the newly created estates (ref.31) in the midlands and south, especially around London. This gave firms such as Wallis and Gilbert the chance to create their innovative designs. We can also witness the move from the pure use of engineers as factory designers to the emergence of the architect engineer and the architect alone. 2. J. Taylor and son ltd. New Southgate, London. Joan Skinner “Form and Fancy”, Liverpool, 1997, page 15. 6. Examples of traditional buildings Edgar Jones, Industrial Architecture in Britain 1750-1939, London, 1985, page 212. 11. The Van Nelle Factory and Brinkman and Van der Vlugt. The Van Nelle tobacco and cocoa factory was built in Rotterdam between 1928 and 1930 by the Dutch architects, Brinkman and Van der Vlugt, and their assistant, Mart Stam. The main block can be seen as the culmination of the multi-storey framed factory, which had steadily developed without fundamental change since the Derby Silk Mill. The owners’ statement that ‘no kind of decoration is used anywhere, as it is held to have an adverse effect upon the workers’ shows the mood of the time, and how owner and architect shared a common viewpoint. Architecturally magnificent, it followed only three years after the Bauhaus building and carried through a complex programme with originality and total architectural consistency. John Winter. Industrial Architecture, London, 1970, page73. 17. Jesse Boots firm was owned by the United Drugs company. 18. Wets, applies to the type of pharmaceutical product involved, i.e. liquid forms rather than solids e.g. tablets and powders. 20. 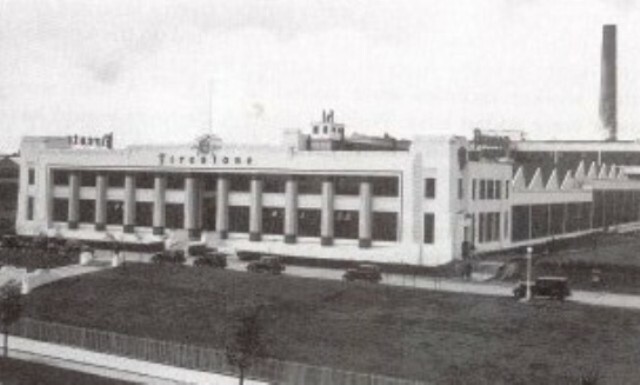 Firestone Tyre & Rubber Co. built in Brentford established a formula that was to be exploited successfully elsewhere on the Great West Road, and for Hoover on Western Avenue. Long office blocks, punctuated by massive pseudo-Egyptian columns, adorned with coloured tiles and entered through splendid doorways, fronted the factory sheds behind. The Firestone example was all the more remarkable when it is considered that the works had been designed in twenty-one days and a mere eighteen weeks had elapsed between the start of construction and the manufacture of the first lyre. The two-storey administration building and the four-storey warehouse were of reinforced concrete (the general contractors being Sir Robert McAlpine & Sons and the reinforced steel supplied by the Trussed Concrete Steel Co., while the single-storey factory situated between them was steel framed. 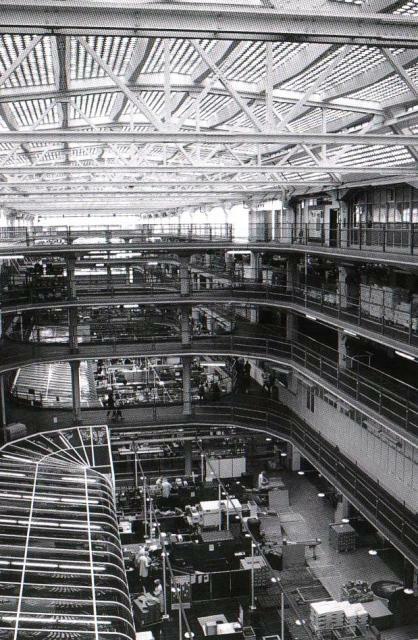 The layout, arranged to accommodate the flow of mass-production pro cesses, the growing emphasis on the workforce’s welfare and the building’s dramatic appearance led The Architect to comment that: both in design and planning, British factories are noticeably improving. In design the improvement is due to the increasing realization that nothing made for human use is unworthy of the attention of the designer; and in planning to the pressure of competition necessitating efficiency both in lay-out and in detail.” Edgar Jones, Industrial Architecture in Britain! 750-1939, p. 213. 21. 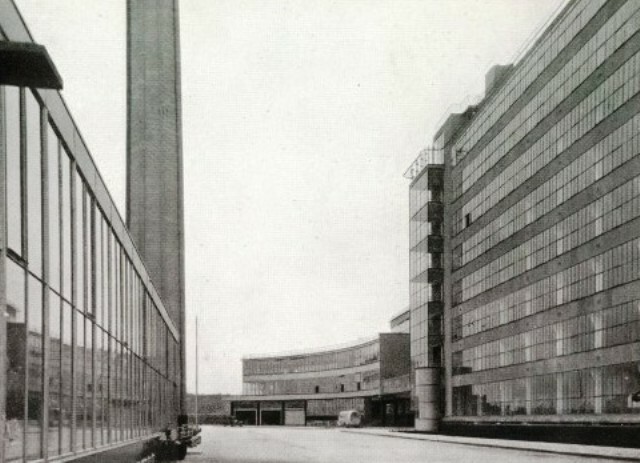 “The Hoover Factory, opened in 1932, advanced the Firestone composition further by the addition of two futuristic staircase towers. TI Egyptian columns, false pediment and ornate entrance were all present but more vigorously interpreted. 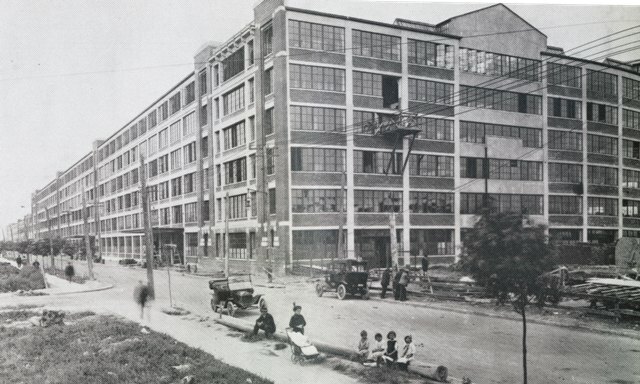 In 1935, to raise the plant’s manufacturing capacity, a four-storey extension was added by the architects. This steel-framed building (rendered in white cement) was designed to “provide clear floor space for machinery, any necessary planning being carried out by means of movable glazed steel partitioning”. The canteen, erected in 1938, featured generous areas o externally hung glass, some of the windows curving around to form the striking entrance”. Edgar Jones, Industrial Architecture in Britain, 1750-1939, p. 214. 25. Art deco: Style of architecture, interior design, and jewellery most popular in the 1930s that used geometrical designs bold colours and outlines. 28. Automotive industries: Ford Motor Company, Dagenham, Essex, 1930. Firestone Tyre Company, q.v note 63 above. Edgar Jones, Industrial Architecture in Britain, 1750-1939, p. 209. 31. Examples include Slough industrial estate 1920 and Team valley estate 1937. 2.4 The “Modern” factory and thoughts from Europe. We cannot leave this period without mentioning relevant events in Europe. The factories and warehouses of the eighteenth and nineteenth century were on the whole the work of practical men and engineers. Architects as such had not availed themselves of such mundane work[i]. Their work had often been limited to adorning an engineered building. However, in the early part of the twentieth century, architects who were starting to react against the superficial historical revivals of this time were taking note of the potential of new materials, steel and concrete, and construction methods available in industrial building. The two came together with the partnership between the German firm of AEG[ii] and the industrial designer/architect Peter Behrens. [iii] Industrialisation in Germany was barely thirty years old and the electrical industry spearheaded by AEG was particularly new and full of enthusiastic ideas. Herr P Jordan asked Behrens to design products for AEG, the packaging, the advertising and the buildings, in short a “corporate image”. The result, building wise was The AEG turbine factory in Berlin (1909), (figure 2.15) often claimed as the “first modern building”[iv]. It is of immense size, almost monumental proportions constructed of steel and concrete, its sides of glass slope inwards as they rise which gives it a heavy solid stance on the ground. A young assistant in Behrens office at the time was Walter Gropius[v]. Other notable junior members at this time were Mies van der Rohe[vi] and Charles-Edouard Jeanneret later known as “Le Corbusier”[vii]. 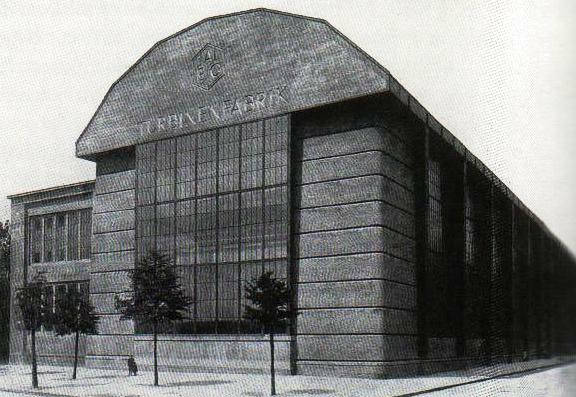 They held positions in the Deutsche Werkbund[viii] who promoted the AEG turbine hall to iconic status and published it in their yearbook of 1913 along with Kahn’s “daylight factories” built in reinforced concrete. The publication argues for a new architecture that reflected the spirit of the age, that of mass production. Also involved with the Werkbund was Carl Benscheidt Sr., a client of Fagus, a shoe last company, in Alfeld an der Rhein. They had already had a reinforced “daylight” concrete factory built by the English agricultural engineer Ernest Ransome[ix] and had already started to design the main body of a new factory with the architect Eduard Werner[x]. They asked Gropius in the spring of 1911 to add modern exterior elevations to promote a progressive image. The result was that Gropius imbued a strong delineation to the facade, marked by an emphatic two-storey brick entrance with its apparently floating staircase (figure 2.16). 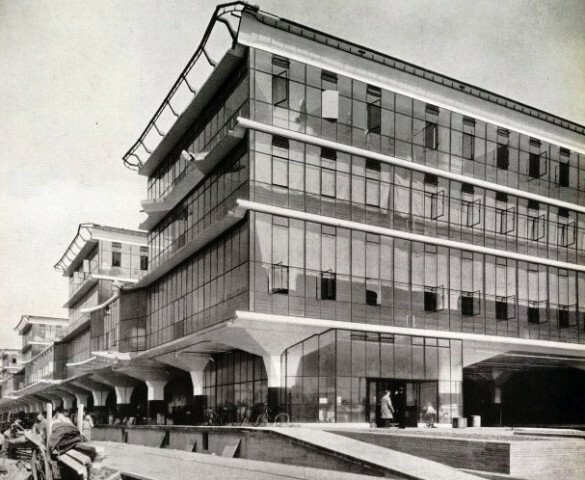 Possibly the first use of glass in this way, Gropius emphasised the glazing and apparently structural innovation of the pier free corners seemingly throwing away all means of support. Therefore, in some cases, a tradition of expressionist architecture had been able to develop in Germany before the war by virtue of patronage by industrialists. It was able to grow in the interwar years through the work of the Bauhaus[xi] and le Corbusier and later was to influence a generation of architects in Germany, USA and eventually Britain. [i] “Within the hierarchy of decorum, industrial structures, warehouses, mills or foundries rated low. In effect they were the Third Estate of the architectural world; not for them the finery of the parliament house or the regal residence.” As Fairbairn recollected,” in this pioneering phase: mill architecture was out of the question … and the architecture of the country was confined to churches, public buildings and the mansions of the barons or lords of the soil.” ), Edgar Jones , Industrial Architecture in Britain 1750-1939, London, 1985, page23. 2.3. Over here, the “Model” Factory and influence from the USA. The development of the multi-storey mill starting in the 18th century was on the whole a British affair which was adapted throughout the world. However, in the early part of the 20th century, across the Atlantic new production methods were being developed, based on the ideas of Frederick Taylor in his publication “Principles of scientific management” (ref.1) and spearheaded by Henry Ford (ref.2)and the needs of the automotive industry. This tied in with the availability of a newly developed reinforced concrete system developed by the Kahn brothers in Detroit. The “Kahn system” (ref.3) as it was patented, was marketed by the newly formed “Kahncrete” company and its subsidiary “Trussed Concrete Steel Company”, or “Truscon” as it was often known. The company’s aim was to sell the system under licence in the USA and Britain where Moritz Kahn sought new markets and established an office in London (1907). Albert Khan (ref.4)completed a factory for the Packard Motor Company (ref.5),Detroit (ref.6)(1903), (figure 2.7) the first American reinforced concrete building and the first to have steel windows imported from England. These elements produced a lighter building than ever before. In 1906 with the Pierce Automobile plant in Buffalo (ref.7), New York, (figure 2.8) he designed a factory in which self-contained work cycles were housed within a single storey, steel framed, top lit by “saw tooth” (ref.8) roof glazed buildings designed for uniform lighting and physical flexibility to aid production within. Khan was then commissioned by Henry Ford to build a new four-storey plant in Highland Park Detroit (1910) (Figure 2.9) and three years later built the factory to house the world’s first moving assembly line. This was for the “Ford model T.” (ref.9) Ford demanded a building with the focus on open space, adaptability, uncluttered areas suitable for production flow lines where the planned integrated processes, from the arrival of raw materials to the finished product, could all take place on one level. His next commission was the Ford Rouge plant (ref.10) (1916), (figure 2.10), a mammoth plant, its assembly line ran through a series of single storey units. Here Khan introduced the use of steel rather than reinforced concrete for its structural framework. Kahn was to develop this design in numerous subsequent factories, all single storey, all lit from above to enable the floor to be kept clear for machinery and processes. Services such as lavatories and offices were placed at a higher, often mezzanine level. These buildings became known as “Model factories” and their design as the “Kahn Daylight system” being based on a regular grid of column, beam and slab. Concrete sections were fully exposed and external wall spaces were glass filled with slender glazing bars. 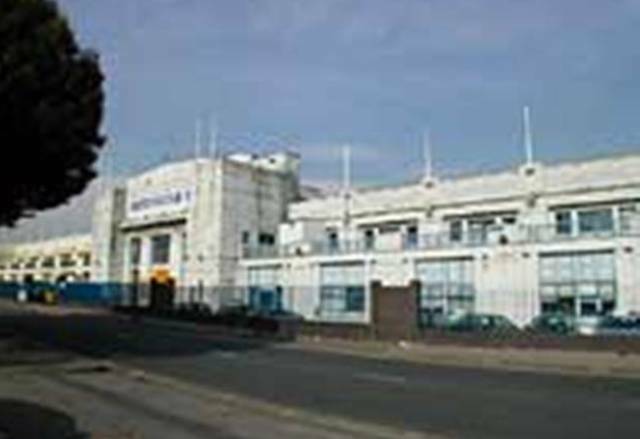 Truscon opened their first example of this type of building in the U.K at Trafford Park, Manchester (1911) for the Ford motor company (figure 2.11). Soon after on a green field site in Dumfries, a three story E shaped factory was built for the Arrol–Johnson Motor Company(ref.11) (1912-13), (figure 2.12). A four story building for the engineers G.J Weir ltd, Glasgow (1912-13) and another for the Albion Motor company in Glasgow (1913-15) (ref.12)(figure 2.13) were also completed. The aforementioned Uniroyal factory in Dumfries may be another unconfirmed early example. The increasing availability of this new fast economic and adaptable reinforced concrete coincided with the shortage of materials created by the military build up for the First World War(ref.13) in Europe, and the relaxing of building regulations. Its versatility also made it more attractive. Truscon took advantage of this, designing innumerable civil factories before turning to establishments required for armaments and defence hardware. 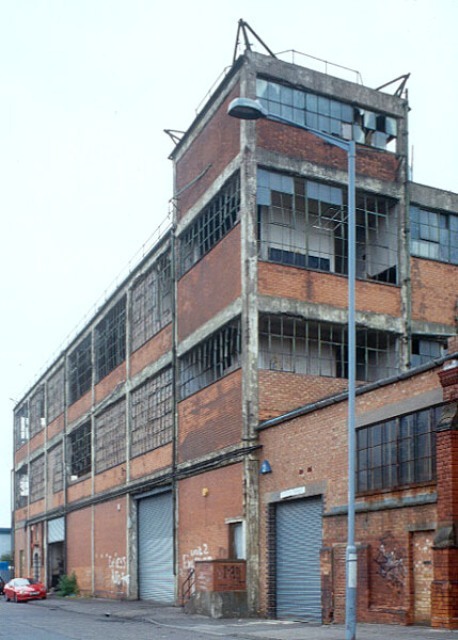 One example being the Birmingham Small Arms factory(ref.14) (B.S.A) (1914), in Small Heath , West Midlands, (Figure 2.14), whose design appeared as a chequer board of concrete piers and rectangular windows. 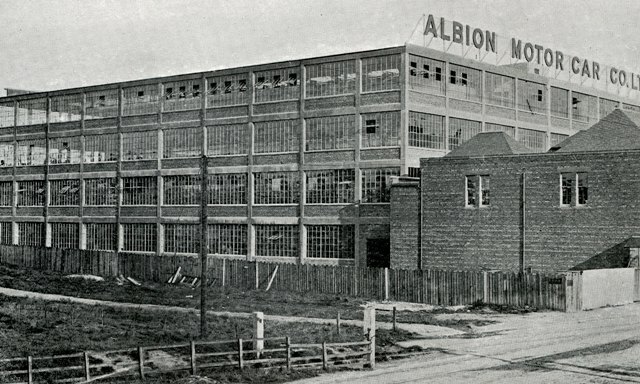 (ref.12)Albion Car Company. The Albion name has appeared on vehicles from 1899 to 1975, (Taken over by Leyland motors in 1950). (ref.13)Companies applying for licences to build a factory or extension during the First war were required to use as little wood or steel as possible Reinforced concrete became the obvious choice as it used less steel framing and concrete was not in short supply. Joan S Skinner, Form and Fancy, Liverpool, 1997, page 28.